2 Blu-Ray Set with Fight Camp + Much More. Also: Includes David Benavidez vs. J'Leon Love, Luis Nery vs. McJoe Arroyo & Chris Arreola vs. Jean Pierre Augustin. Includes Danny Roman vs. Moises Flores & Javier Fortuna vs. Adrian Granados. 2 Blu-Ray Set with Brook vs Spence Jr.: The Countdown + Much More. Also: George Groves vs. Fedor Chudinov, Dave Allen vs. Lenroy Thomas & Jamie Cox vs. Lewis Taylor. 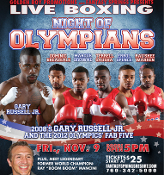 Includes Robert Easter Jr. vs. Javier Fortuna. Includes Krzysztof Glowacki vs. Steve Cunningham. Includes Errol Spence Jr. vs. Alejandro Barrera & Erickson Lubin vs. Alexis Camacho. Includes Errol Spence Jr. vs. Chris van Heerden. Includes PBC: Corner To Corner. Also: Errol Spence Jr. vs. Phil Lo Greco & Terrell Gausha vs Luis Grajeda. Includes Jesus Cuellar vs. Juan Manuel Lopez & Josesito Lopez vs. Rafael Cobos, Jermall Charlo vs. Norberto Gonzalez, Errol Spence Jr. vs. Noe Bolanos & Julian Williams vs. Eliezer Gonzalez. Includes Dominic Wade vs. Nick Brinson. Includes Errol Spence Jr. vs. Raymond Charles, Joseph Rodriguez vs. Francisco Arellano & Travell Mazion vs. Antonio Sanchez. Includes Errol Spence vs. Peter Olouch & Terrell Gausha vs. George Sosa. Includes Francisco Vargas vs. Jerry Belmontes, Jermall Charlo vs. Joseph De Los Santos, Joseph Diaz vs. Carlos Rodriguez & Errol Spence vs. Pipino Cuevas Jr.
Includes Errol Spence vs. Emmanuel Lartey & Rau'shee Warren vs. Jhon Molina. Includes Anthony Dirrell vs. Don Mouton, Errol Spence Jr. vs. Brandon Hoskins, Joseph Diaz Jr. vs. Eric Gotay & Carlos Ivan Velasquez vs. Giorgi Mtchedlishvili. Includes Rau’shee Warren vs. Luis Rivera, Errol Spence vs. Jonathan Garcia, Dominic Breazeale vs. Curtis Tate, & Daquan Arnett vs. Jeremiah Wiggins.